The WATA technology developed by Antenna uses a simple, manageable process of electrolysis to convert a quantity of salt and water into sodium hypochlorite. The resulting solution can be used for drinking water chlorination or as a disinfectant for use in households, hospitals or community clinics. The WATA solution is specifically designed for use in the context of communities in developing countries. With this system, communities can source locally and quickly available chlorine to protect against diarrhoeal diseases such as diarrhoea or dysentery. Eventually, this system can become a source of income by selling the chlorine produced. Although it is intended for development projects, it can also be used in emergency situations due to its simple and rapid operation. Decentralised production is geared to local demand, thus users are independent of any external chlorine supply and avoid transport and storage problems. Running the device simply requires clean water, kitchen salt and any source of electric current (from the local grid, a generator, battery, solar panel, etc). A short, hands-on training session is needed to operate the devices properly. 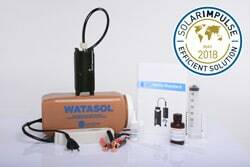 When used correctly, WATA devices produce a regular concentration of active chlorine of 6 g/l. The quality-control tools developed by Antenna make it possible to check the concentration reached and the water quality after dilution. WATA devices are optimised to suit the field conditions found in developing countries. The cost price for one litre of active chlorine concentrate is CHF 0.06 cent. One litre of concentrated solution is enough to treat 4,000 litres of contaminated water. Antenna’s range of products allows you to select the device that provides the best fit for the needs of the project. It can provide water to a health centre, a small community, a city or a region.